Most international flights go via Auckland or Christchurch. Passengers must claim baggage and clear immigration, customs and quarantine. You must declare all content of your luggage! Then you re-check-in at the Domestic Terminal to fly to Wellington. Flights that transfer in Brisbane, Gold Coast, Sydney or Melbourne fly direct to Wellington. NOTE: You must have a valid Australian visa - even if you transit only. You must have a valid visa to enter New Zealand. Some countries enjoy visa waivers. Please contact us if you need an invitation letter for visa or other purposes via: caadria@vuw.ac.nz. More info about visas are here. 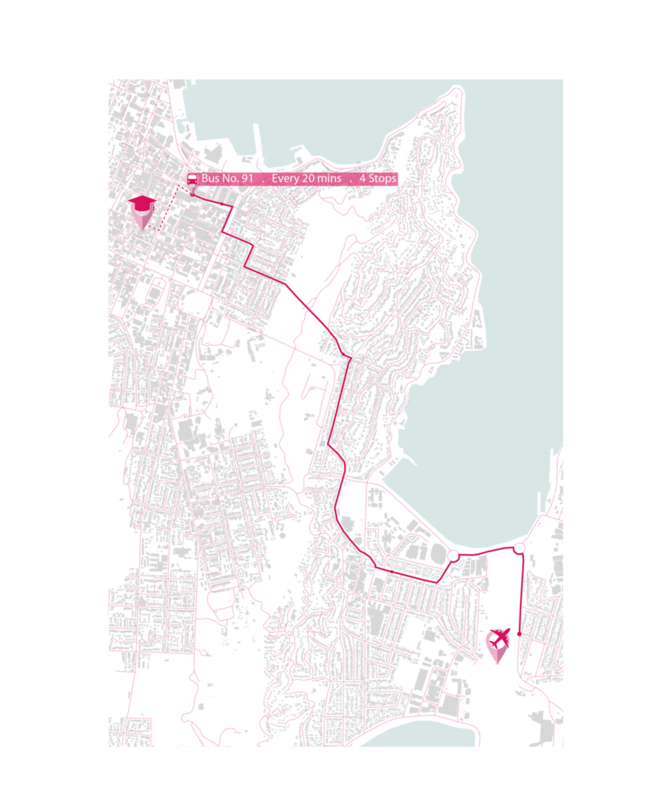 Bus: Airport Flyer runs from Wellington Airport into Wellington CBD every 10 minutes. The closest stop to the campus is Manners Street corner Cuba Street (near Burger King). From there, it is a short walk up Cuba Street, turning left onto Vivian Street where the campus is located. NZ Bus has all information about ticket prices and timetables for the Airport Flyer. Tickets can be bought on the bus. (12.00 NZD - from Airport to Wellington Railway Station, please let the bus driver know you stop at Manners Street). Metlink has all other local bus routes and timetables. Airport Taxi or Shuttles: Wellington Airport is 8 kilometres away from the Central Business District. The average journey is 15-25 minutes depending on traffic flow and time of day. Taxi ranks can be found directly outside the baggage claim area on Level 0 of the main terminal. Fares vary between service providers, a Taxi/Executive Cab cost between $27-40 NZD. You can pay this fare with cash, credit or EFTPOS. Taxi ‘Super-Shuttles’ vans are cheaper than a normal taxi. Uber / Zoomy / Ola: You will need to download the App to book a car. Uber (Zoomy, Ola) is a car sharing service that may be cheaper than a taxi service. Their fares to the Te Aro Campus may vary on different factors (current demand, traffic, etc) so check the price estimator on the app before booking. Car: Please ensure your hotel or other accommodation provides car parking or areas for you to park your car while you are at conference. Check GPS services such as Google Maps or ask car rental services if they are able to provide GPS hardware for best routes to your accommodation or campus. The closest hotel to the Te Aro campus is CQ Hotel which is across the road. CQ offers sheltered car parking facilities for those with rental or private cars. You must book early! There are many other hotels via WellingtonNZ and Airbnb in options in Wellington. All are very good connected to the Te Aro Campus via public bus routes. Wellington is the small, windy yet charming capital of New Zealand. Home to Victoria University and CAADRIA 2019, there are plenty of other things for you to discover during your time in Wellington. Come find and enjoy the quirky things that makes Wellington our home. New Zealand holds many natural and cultural attractions whether it is the Geysers in Rotorua, to Wine Tasting on Waiheke or action packed activities in Queenstown; there is no shortage of adventure or beautiful scenery. Discover what New Zealand has to offer you to make your trip to CAADRIA 2019 that much more memorable. We wish you all the safest of travels and look forward to seeing you in Wellington for Intelligent and Informed, CAADRIA 2019.